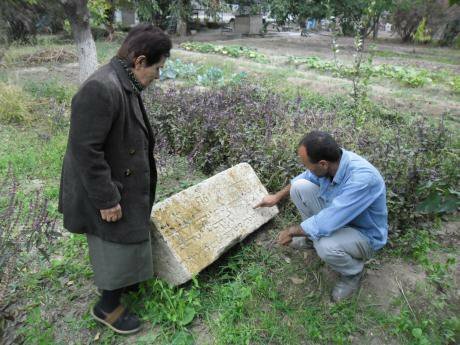 Scattered throughout Russia and the South Caucasus, Assyrians are looking for recognition of their suffering. The boom of his voice echoes through his kitchen, and outside into the gardens and courtyards of the village of Arzni. Arzni, a short drive from the Armenian capital of Yerevan, greets visitors with a trilingual sign – in Armenian, Russian, and Assyrian Neo-Aramaic. This is an Assyrian village, and Valery is an ethnic Assyrian. The word 'Aturaya' (Assyrian) means many different things, and Assyrian identity stands at the centre of an intricate debate. The indigenous, Neo-Aramaic speaking Christian populations of northern Iraq, northern Syria, and southeast Turkey have long been divided along ecclesiastical lines. Recent moves to forge a common Assyrian, Aramaean or Syriac identity have made only limited progress. Members of the Syrian Orthodox (Jacobite) Church refer to themselves as Syriac, while Chaldean Catholics identify as Chaldeans. Those of the Assyrian Church of the East – also known as the Nestorian Church – also identify as Assyrians. Most of the Assyrians who arrived in Armenia after the 1828 Treaty of Turkmenchai between Persia and Russia belonged to the Nestorian Church. 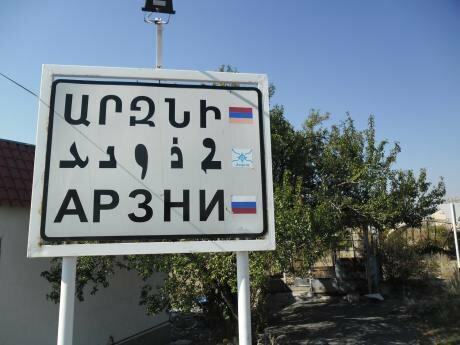 A sign at the entrance to Arzni village, Kotayk Province, greets visitors in Armenian, Assyrian Neo-Aramaic and Russian. To this day, Assyrians in Armenia refer to themselves as Urmijenāye – people from Urmia – in reference to the lake district in Iran, the location of their ancestral villages. After the First World War, Assyrian refugees from across the former Ottoman Empire joined them. Assyrians across the former Soviet Union bear Russified surnames – Bit-Tumas became Tumasov, Bit-Yonan became Yonanov. A home to many speakers of Neo-Aramaic, Dvin is undergoing a linguistic revival. 'Shlama, Rabi!' calls out a voice from a walnut tree; “Hello, Priest!” – words familiar to an Arabic or Hebrew speaker. Father Isaac Temris smiles at one of his congregants, harvesting the nuts for buyers at the markets in Yerevan, and the occasional priestly passer-by. For the villagers of Verin Dvin on the Ararat Plain, subsistence farming is one way to make ends meet, though only just. Father Temris is an Assyrian from Erbil, in Iraqi Kurdistan, and has served as pastor in Verin Dvin since 2013. As Temris sees it, his role has been to help Assyrians in post-Soviet Armenia rediscover their ancestral faith. Cultural differences between Assyrians from traditional Christian communities Iraq and those raised under Soviet atheism exist, but are not insurmountable. 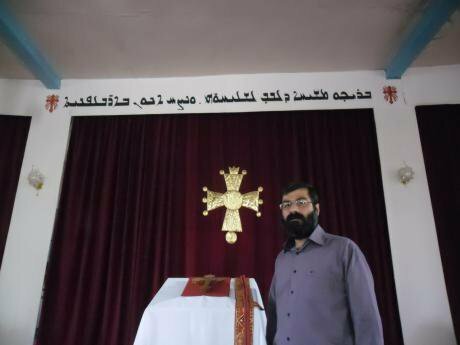 A native of Erbil, Iraqi Kurdistan, Father Isaac Temris serves as the priest of Mar Toma church in Verin Dvin. A home to many speakers of Neo-Aramaic, Dvin is undergoing a modest linguistic revival. The language is now taught to local Assyrian children using the traditional Estrangela script. At Father Temris’s initiative, the Mar Toma Church – built in 1828, but converted to a warehouse during the Soviet era – was restored with generous donations from Armenia, Iraq, and Europe. Father Temris also aspires to finish a new school to replace the decrepit structure currently in use. A frame of concrete breeze-blocks stands as testament to this aspiration, with a wrought iron fence displaying letters of the Assyrian alphabet. A white, blue and red Assyrian flag has been painted on a nearby gate. Verin Dvin’s school has dedicated a small room for Assyrian cultural events and festivals. The Patriarch of the Nestorian Church and secular Assyrian intellectuals alike stare down at the childrens’ handiwork: cardboard models of ancient Nineveh and clay cuneiform tablets. Modern Assyrian nationalism traces its descent back to the glories of the ancient Neo-Assyrian Empire. Younger generations of Assyrians have names to match: young Sargons, Ninvehs, and Ashurs walk the streets of Verin Dvin alongside the more traditional Christian names like Thomas, Maryam, and Isaac. A gaudy painting of a lamassu – a winged lion or bull with a human head – hangs in Verin Dvin’s local administration building, flanked by Assyrian and Armenian flags. These mythical beasts have been sited as guardians at the entrances of important buildings for thousands of years. The ruins of several monumental specimens still stand in Iraq – or did until very recently, before ISIS destroyed them. Some have survived in Western museums, taken abroad in the nineteenth century by European archaeologists. 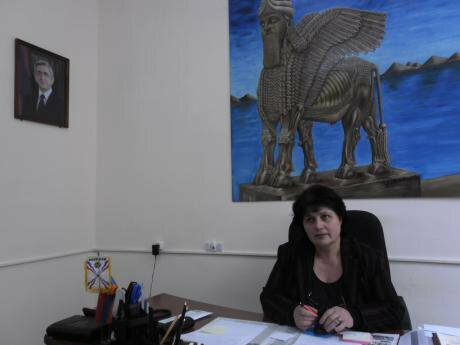 An ancient Assyrian 'Lamassu' hangs in the office of Ludmila Petrova, mayor of 'Aysori Dvin' (Assyrian Dvin). Attendance at Mar Toma Church does not always meet Father Temris’s expectations, perhaps the result of residual anti-clericism in Soviet days, but also the emptying of the town of young people – they move aboard to work in Russia. Poor economic prospects, notes Arsen Mikhailov, Assyrian Community leader from the Atur Organization, are a major problem for everybody in Armenia, his own community are no exception. 'Unemployment,' wrote Soviet researcher Konstantin Matveev in 1979, 'is a constant scourge among the Assyrian community.' The Assyrian population of the country numbered 6,183 in 1976, and has since declined to 2,769 primarily due to emigration. Locked houses with the words 'Vadjarvum e' (For sale) are a common enough sight in Armenia’s villages, and the four Assyrian settlements are much the same. With relatives and work in large South Russian cities such as Krasnodar and Rostov, what is left to keep families in Verin Dvin? What is left to keep families in Verin Dvin? For most Assyrians, the late Soviet era was one of stability and a comfortable (if modest) life working on one of eight Assyrian-majority collective farms across the USSR. Soviet scholars such as Matveev portrayed the Assyrians of the USSR as living testimony to the hope the Soviets had to offer to the peoples of the Middle East living under European rule. Nevertheless, some memories remained buried. Soviet Assyrians – or 'Aysors' as they became known – were largely isolated from other members of the 2-3 million strong Assyrian Diaspora. Priests were exiled, churches closed or – in the case of the church at Nor Artagers – dynamited. Until the 1930s, the Assyrian language had to be written in a specially devised Latin alphabet: to better to isolate its speakers from their traditional religious literature. Assyrian intellectuals such as Fraidoon Atturaya (1891-1926), leader of the Assyrian Socialist Party, were executed, often accused of collaboration with the British to further their 'bourgeois nationalism'. The year 1949 saw mass deportations of Assyrians to Siberia, where many perished. In a particularly grim stroke of irony, as Assyrian journalist Ilya Vartanov noted in his 2001 memoirs, many deported Assyrians were accused of spying for Turkey. In light of the Assyrians’ history under Turkish rule, this accusation was farcical, at best. The Sayfo, as the Assyrian Genocide is known, saw the deaths of between 300,000 and 700,000 Assyrian, Chaldean, and Syriac people (alongside over a million Armenians) under the Young Turk leadership of the Ottoman Empire. Pogroms continued in the newly formed states of Turkey and Iraq during the interwar era. Demonstrations in Yerevan raised the profile of the Armenian Genocide in the USSR from 1965 onwards, and over the following decades, Assyrians began to ask – what of their own genocide? Memorial to victims of the Sayfo, or Assyrian Genocide, in central Yerevan, Republic of Armenia. In central Yerevan, Armenian and Assyrian flags fly over a monument decorated with lamassu on Nalbandyan Street. In Armenian, Assyrian, English, and Russian, the monument commemorates the 'innocent Assyrian victims of 1915,' to whom it was dedicated in 2012. 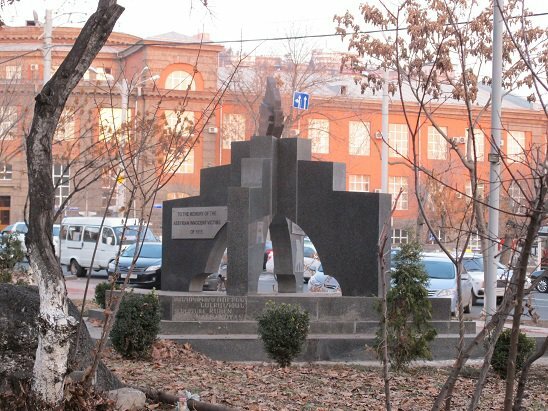 Compared to the neighbouring Armenian-Russian friendship monument, this one is easily overlooked, but is a landmark for the Assyrian community. 'The difference between the Armenian and Assyrian Genocide,' says Assyrian community activist Irina Sagradova, 'is that the Assyrian Genocide still continues.' A stark statement, but one keenly felt as the centenary of both genocides approaches with ISIS massacring and driving what is left of Syria and Iraq’s Assyrian communities into exile. The Armenian government is prepared to help Assyrian refugees – that is, if they can reach Armenia first. Sweden (home to a large Assyrian community) was for many years the only state to recognise the Assyrian Genocide, though others have joined it in recent months. Armenia has only just recognised the Sayfo. The country’s minorities play an important role in Armenia’s nation-building: a common understanding is that the modern Republic of Armenia is somehow the homeland for all peoples – Assyrians, Greeks and Yezidis – who perished alongside Armenians in and after 1915. The modern Republic of Armenia is somehow the homeland for all peoples – Assyrians, Greeks and Yezidis – who perished alongside Armenians in and after 1915. Yet a recent attempt to extend recognition to these peoples, on the initiative of Heritage Party MP Zaruhi Postanjyan was rejected in 2012, one ground being the vague wording of the draft bill, which urged the government to recognise the genocides of Assyrians, Greeks, Yezidis 'and others'. Sagradova herself submitted a bill, but to no avail, and debate dragged on among Armenian lawmakers on possible recognition. The same reasoning is suggested for why the Assyrian community of Khanlar, Azerbaijan fled as Armenia and Azerbaijan prepared for war over Nagorno-Karabakh in 1988-1991. Returning from Dvin and planning a visit to Dimitrov, I paid a visit to Misha Sadoyev and shared my impressions of the community. Misha was also an Assyrian – the Assyrian, in fact, in Armenia’s musical world. Despite a pamphlet showing a map of Iraq lying on Sadoyev's dining room table bearing the words – in Arabic, English, and Neo-Aramaic – 'State of Assyria', the Assyrians do not have a state. They have lived everywhere. Misha's ancestors arrived in 1848 as the Bit-Sado family – well before the events of 1915.